Angry Birds Hunter is an interesting shooter with cute graphics. 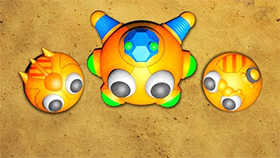 This game has simple gameplay and is suitable for all ages, especially children and families. You can experience this game on your browser because it is a flash game. In this game you will be playing with a horizontal screen and your task is to shoot 10 angry birds. These angry birds will fly in front of you and you will use guns to shoot them. You need to shoot 10 angry birds to complete the stage. In each turn, one or two angry birds will appear and you only have 6 "bullets" to destroy them all. If you cannot destroy the angry birds with this number you will lose. But if you destroy all of them, your gun will be reloaded. The interesting point in this game is that there are so many angry birds. They will vary in size, speed ... and how they fly. You need to shoot accurately to destroy them. When you shoot all the angry birds on the game screen, your gun will be reloaded.